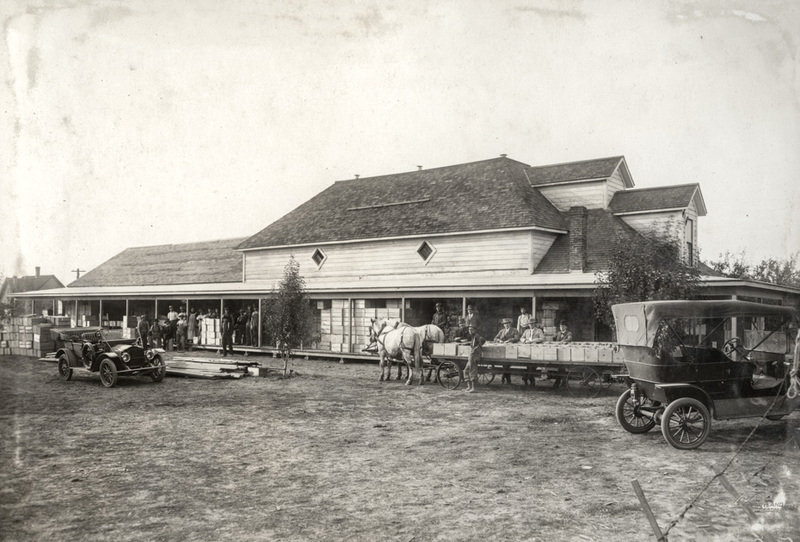 Anyone recognize this packing house? It's a pretty major operation, but I haven't seen it before. This is a Benjamin Gifford image, circa 1910. All the men to the left seem to be of Japanese descent. The automobile to the left is a White steamer. I could use help dentifying the other auto. Very nice image a good sized fruit facility. The men in the suits are probably the owners/operators of it.No doubt the owners of the cars. Many young men came from Japan seeking a better life. A good number came to Hood River. Some left sweethearts at home. Eventually, they were either able to return for them or send for them. There was also some that had mail order brides. Nice team of dapple grays. Such a shame that an excellent photographer like Gifford was hired to take photos, and yet no labeling. HHR photo #46 shows a White Touring car amongst the blossoms. Charlott says it is Joe Jarvis of Pine Grove. Any connection to this photo? Since the boxes are loaded on a wagon, the railroad must not be right next door. However, the boxes do not look like they are stacked for a long haul. That fruit doesn't appear to be ready for shipping, as no lids on the boxes. There are a lot of similarities between the car on the right and the car in photo #46. There are three new autos in town. Two of the sales were made by Gilbert-Vaughan Implement Company, having sold a Chalmers-Detroit to R.E. Harbison, and a Cadillac-30 to J.R. Putman. The third new machine was bought in Portland by P.S. Davidson. It is a White Gas car similar to the auto bought by his brother Frank Davidson a few weeks ago. Interesting theory, Val. I went back to the original scans to compare them based on your comment. Unfortunately, the roof line differs in several ways and there is an extra chimney on the house in the background. Chimneys get added or removed all the time, but the roof structure differences are significant.